our people and this wonderful resource. in the Far North of New Zealand. Our Māori beekeeping business is vertically integrated from the flower to the honey jar and we are continuously working with innovative partners to progress and develop our business further. Our business relies on the strength of our relationship with our honeybees and all partners across our business - whānau, landowners, employees and customers. Bobby has been beekeeping for over six years. He began with assisting large corporate beekeeping companies operating in the Far North, to founding his own beekeeping operation and Honey Extraction Factory. Bobby is descended from Te Rarawa, growing up in the rural Māori community of Panguru. Sera began beekeeping four seasons ago. She oversees the daily administration management and also assists with the Queen Bee rearing operation. Sera is descended from 3 Māori Grandparents being: (Te Aupouri, Ngāti Kuri, Te Rarawa), (Ngāpuhi), (Ngāti Maru, Ngāti Paoa). Aaron runs the day to day operations of the Extraction Factory and honey storage facility. He manages all client relationships, ensuring delivery times of the beekeepers supers works with the needs of their operations. Te Rina has a Law Degree and second Major in Te Reo Māori. She helps to ensure that all factory operations meet MPI standards and also manages clients and landowners. Te Rina descends from Ngāti Kahu, Te Rarawa, Te Paatu, Ngāti Hine, Ngāti Wai, Ngāti Whātua, Ngāti Maniapoto, Ngāti Rangitihi, Ngāti Awa, Tūhoe and Ngāi Tahu. Tā Moko is a traditional Maori tatoo which represents history, culture and status. This form of tattooing is worn with honour and pride. 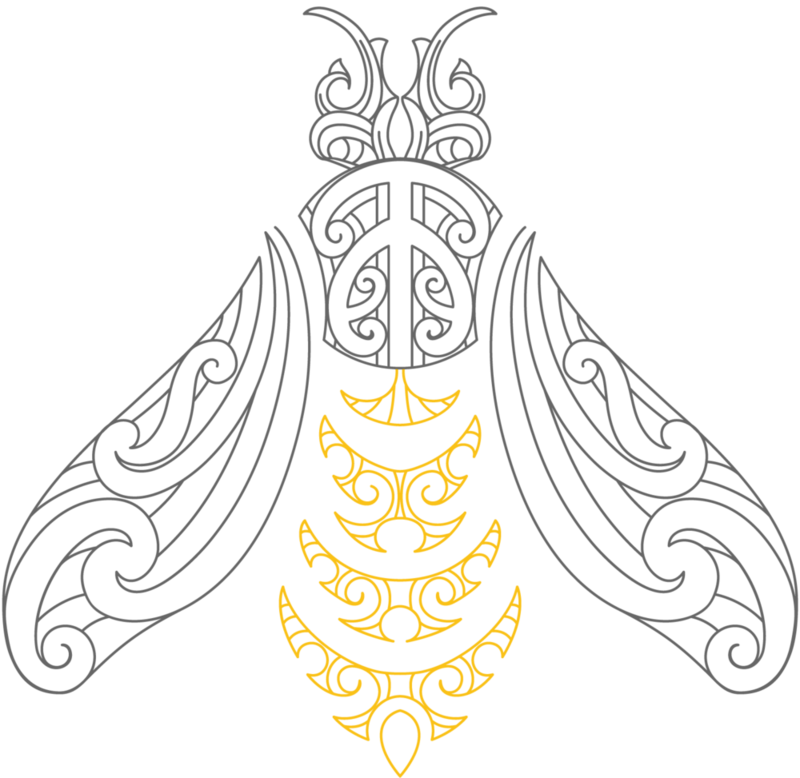 Like our honeybees our Tā Moko is our treasure. Our tohu honey bee encompasses the following symbols which form the foundation of our thinking and our business that has evolved from our bees and our Māori culture. Symbolising good luck, safe journey, strength and prosperity. Symbolising natural abundance, strength and determination. Symbolising new life and growth. Water. Symbolising the harmony with the forces of nature. We apply the Tikanga we have been gifted by Tupuna to our everyday life and business through which we strive to achieve great success together. Mana Kai Honey sees a genuine opportunity to work with Māori and the New Zealand resources available, to realise a vision by collaborating with our people. Whakapūpūtia mai ō mānuka, kia kore ai e whati. We are proud to be of Māori descent and our core values (Ngā Uara) reflect that. Māori culture is rich in symbols that represent the connections between nature and man. Ehara taku toa i te toa takitahi, engari he toa takitini ke. Produced in New Zealand by bees that pollinate the Manuka bush, Manuka Honey is one of the most unique and beneficial honeys in the world. Manuka Honey contains a highly beneficial trilogy of hydrogen peroxide, methylglyoxal (MGO) and dihydroxyacetone (DHA). These chemicals result in antibacterial qualities which have been known to be beneficial for use on burns, wounds, ulcers, sore throats and more. We bring you a portfolio of honey which ranges from high UMF Manuka to Native Flora and Multiflora blends, all beautifully crafted by our honey bees. This honey has been sourced from pure and natural New Zealand environments, to produce pure and natural honey. Mana Kai Honey is a licensed member of the UMF Association. UMF is an internationally recognised organisation which sets standards to assure natural, unadulterated, genuine Manuka Honey. New Zealand by honey bees that extract nectar from the indigenous Manuka Bush.